Listed among the highest-rated apartments in Tomball, Texas, Camden Northpointe is a gated community featuring spacious one, two and three bedroom apartment homes. Our pet-friendly apartment community is located directly off Northpointe Blvd and Highway 249 on the south side of Tomball, less than 20 minutes from Cypress, Texas. Life at Camden Northpointe feels like a vacation with first-class amenities at your fingertips. Enjoy a swim in your resort style pool, relax on the sundeck with WiFi, or BBQ with your friends in the outdoor retreat complete with fireplace and kitchen. The fitness center is fully stocked with cardio equipment and free weights, and our social lounge is the perfect oasis when you need a place to meet or a great cup of coffee. At Camden Northpointe, pets are family too! We offer a private fenced-in Dog Park with pet wash station they’re sure to love. Residents receive a technology package included in their total monthly rent with a savings of up to 55% off retail. This money-saving package includes high-speed internet up to 45 Mbps and digital video channels through AT&T. When it comes to your Tomball apartment home, we have the perfect floor plan to meet your budget, needs and wants. Each apartment includes beautiful kitchen islands, spacious bathrooms with garden tubs, black or stainless appliances, large walk-in closets and granite countertops. Garages and covered parking are also available. Escape the hustle and bustle of city life without losing the convenience. Residents enjoy 30-minute commutes to Downtown Houston and shopping and dining at The Vintage, as well as access to the highly-acclaimed Tomball ISD. Come home to Camden Northpointe. You deserve it! 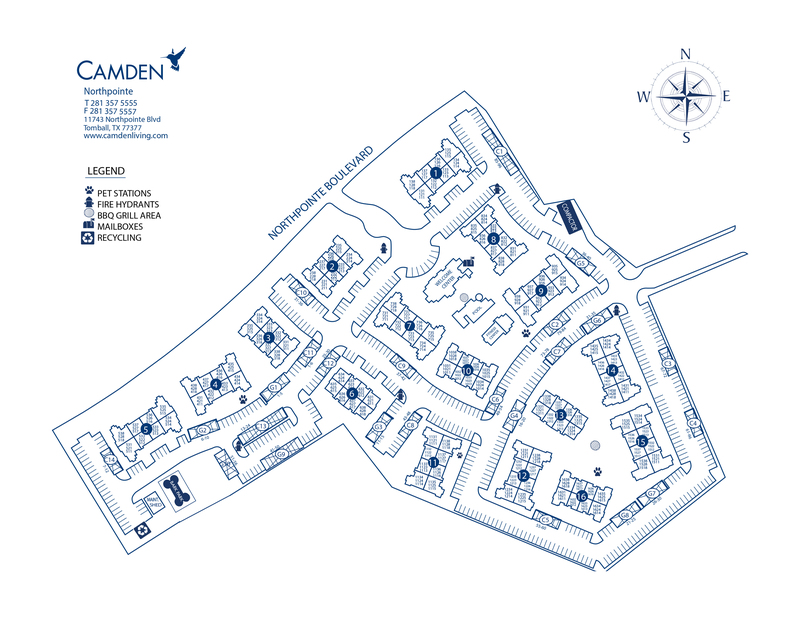 View our available apartments here. At Camden, your pets are family too! We welcome cats and dogs, up to three pets per apartment home, with no weight limit. Restricted breeds: American Pit Bull Terrier, American Staffordshire Terrier, Staffordshire Bull Terrier, Rottweiler, Doberman Pinscher, Chow, any mix of the previous breeds, or any other dog or breed deemed aggressive. Call us with any pet-related questions! Get the perfect spot! We have ample open parking for our residents and marked spaces for visitors on a first-come, first-serve basis. Detached garages and carports are also available to rent. Call for details!